A simple, rugged, fully-reversible, 2 1/2-hp. 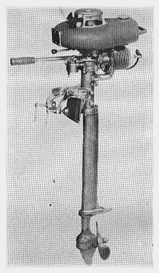 air-cooled outboard motor is offered by the Continental Mfg. Corp. It weighs 22 lbs. In addition to the complete, assembled motor, it is also available as a kit which the manufacturer states can be assembled in about an hour and a half with only a screwdriver and a crescent wrench. The cost of the kit is $59.95 and the assembled motor is $79.95 (FOB Los Angeles). A deluxe Sport and Deluxe Kit is also available at $10.00 above the regular models. This model has an automatic rewind starter. Manufacturer: Continental Mfg. Corp., Washington Blvd. at Motor Ave., Culver City 8, Calif.